Our friend returned from Japan with some goodies from the the Tokyo Palmers. I felt inspired to try and make Enzo a Bento. 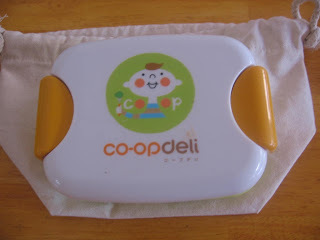 He got this cute little Bento box. 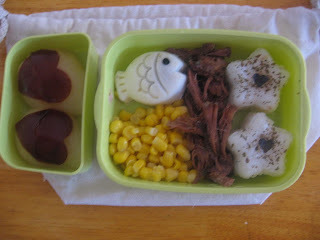 This is a close up of my Bento making experience. If you are addicted to scrapbooking or card making as I am, let me warn you that it totally felt like scrapbooking on food. It could potentially become very addictive. 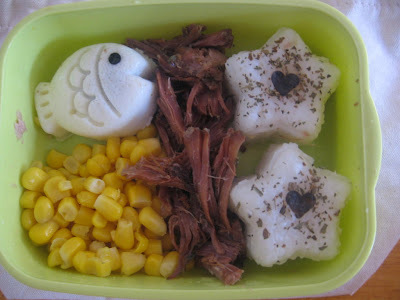 The star shaped rice is pretty cute but the egg shaped fish was my favorite. 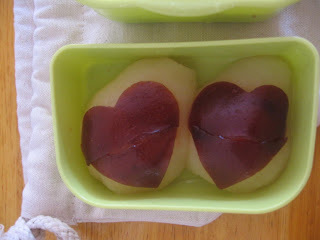 The pear halves have heart shaped fruit leather on top. The cool little gadgets plus a few of my own scrapbooking supplies are what made the whole thing come together. I was given instruction to place a hot hard boiled egg inside the fish mold and then place the whole thing in cold water for 15 minutes. I think my eggs are too small because after 3 failed attempts I decided to try something else. I put a raw egg inside and boiled the whole thing for about 20 minutes and then placed it under cold water. This process might be slightly carcinogenic. oops. Cute things though huh? 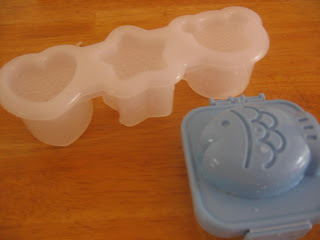 I can see myself moving from stamp obsession to egg mold obsession. I was bummed that Enzo was freaked out by the fish egg. 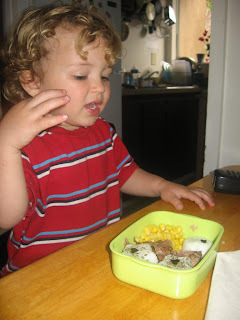 He has a thing about texture and abandoned the Bento. 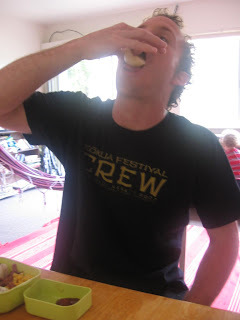 Christian on the other had loved the Bento. Success! 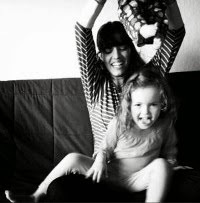 Extremely Cute. She has the egg thing too. Maybe you can ask her how she does it. I hadn't seen that blog. I just checked it out. I like the Elmo bento that's on her first page. I bet Enzo would eat that.You can probably find bento making things in Hawaii or you could use this as a reason to visit J and B and pick some up yourself. FUNNY! Just wanted to let you know I left a comment on the Women's day entry in case you don't think about checking two entries back! Hope you all are doing well! Damaris, that is absolutely a talent! It's so cute! You can eat it? ;) I tried making my food cute, and my hubby told me I was watching too much food network! (He was right!) But it was still fun. Hmmm... I feel another blog post coming on... ooo and thanks for the suprise sauce recipe, it sounds so yummy, I'll have to try it! I love the Bento! Can you get the molds in the states?